In my last post I showed gems being used for .NET. Now let’s talk about How. Most of this stuff I’ve learned over the past two days, so if I have a mistake here or you have a better idea, please don’t hesitate to offer a better solution. The Gem::Specification reference is your friend. In order to create a gem, you need to define a gem specification, commonly called a “gemspec”. A gemspec consists of several attributes. Some of these are required; most of them are optional. From here you learn what is required and what will just get you there. 1. 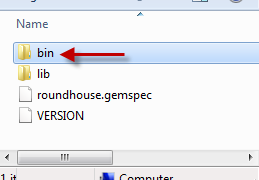 Create a folder named gems in your top level source directory. 2. 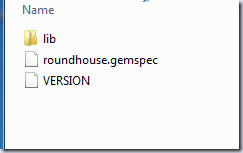 In that folder we are going to put our gemspec and version files. This is where we will store the files in source control (and one of them may become autogenerated). 3. 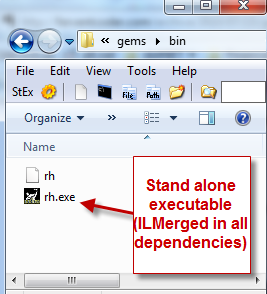 We will bring our gems folder to our compiled source folder after we build. Then we can add in the compiled output. 1. Create a file named project.gemspec. In our example it is roundhouse.gemspec. This is the most important file for this entire process. 2. Open the gemspec in your favorite notepad editor. Copy the below in and change it for you needs. 3. Just about everything with tick marks above you will edit to suit your needs. spec.name and spec.rubyforge_project (and the gemspec file name) should all match and not be an already existing project name on RubyForge. You can also set up description for multiple lines. dependencies are specified in standard Ruby syntax. What we call references. You have a dependency on them existing for your library to run. See this post. This file is stupid simple. It’s a version number. I believe you can put whatever you want in here. It’s probably best to use the Assembly Version number here and stick with the .NET 4 octets of numbers (like 0.0.0.0) for version. 1. Create a file named VERSION. 2. Open it in your favorite editor and put the version you want here. 1. Create a folder called lib. 2. 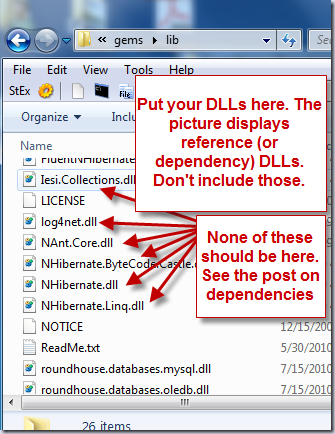 Copy YOUR compiled DLLs into here. 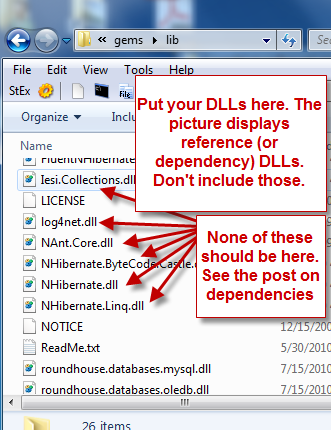 Your references (or dependencies) should not go here. See How To: Gems and .NET - Dependencies. Create a docs folder. In that folder goes your documentation. This could be release notes, a ReadMe, actual documentation. This area is open. Just make sure you add the docs folder to the specification. If you want to give someone the ability to run an executable from the command line after installing your application with gems, and you use .NET, this is how you do it. 1. Create a folder named bin as a subdirectory next to the gemspec. 2. Put your executable (and dependencies) into the bin directory. 4. Don’t forget that space at the end of your executable name. 5. Open your gemspec. We need to make sure we have spec.executables filled out and our new directory added to our Files. You must already have Ruby (1.8.6 or better) and RubyGems installed and/or updated to at least 1.3.7 (gem update –system). You will want to use a RubyInstaller version of Ruby under the Ruby on Windows section. 2. If there are no issues, you should have a gem for upload. 3. Create an account with RubyGems.org. 4. Ensure your project name isn’t already taken by searching for it. If it is you will need to rename your gemspec file, spec.name, and spec.rubyforge_project to a name that is not taken. 6. Let it finish. 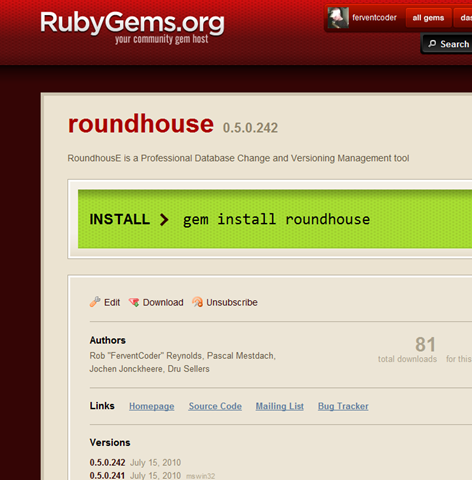 Head out to rubygems.org and look at your shiny, new gem!